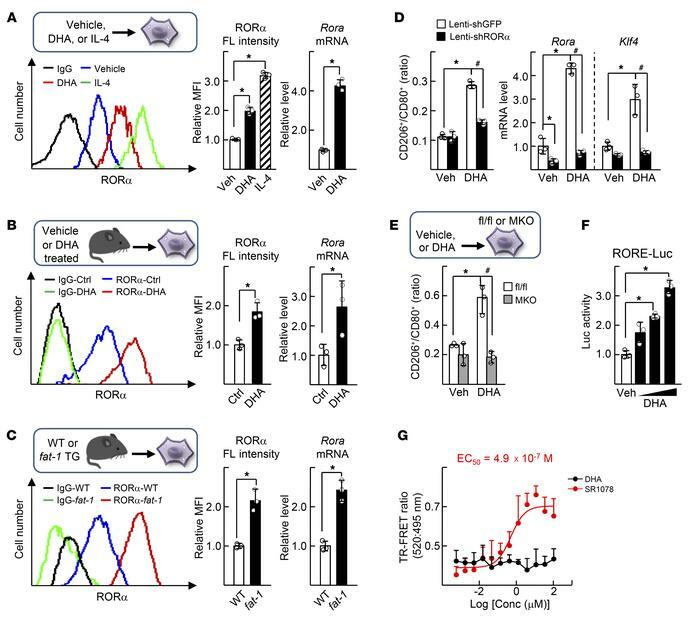 DHA increases expression of RORα and induces M2 polarity switch in the liver macrophages. (A) The primary culture of liver macrophages was treated with vehicle, 50 μM DHA, or 20 ng/ml IL-4 for 24 hours. (B) The C57BL/6 mice were treated daily with vehicle (Ctrl) or 5 mg/kg BW DHA by i.p. injection for 5 days, and then the primary liver macrophages were isolated. (C) The primary liver macrophages were isolated from WT or fat-1 transgenic mice. The fluorescence (FL) intensity of stained RORα protein in the liver macrophages was measured by flow cytometry (left). The numbers represent relative mean fluorescence intensity (MFI) of stained RORα protein (center). The mRNA level of Rora was measured by qRT-PCR (right). *P < 0.05 (n = 3) for A–C. (D) Liver macrophages were infected by lenti-shGFP or lenti-shRORα for 24 hours and then treated with or without 50 μM DHA for 24 hours. The numbers of CD80+ F4/80+ and the CD206+ F4/80+ macrophages were analyzed by flow cytometry and the CD206+/CD80+ ratio was determined (left). The mRNA levels of Rora and Klf4 were measured by qRT-PCR (right). (E) The liver macrophages obtained from the livers of floxed and RORα-MKO mice were treated with or without DHA for 24 hours. The CD206+/CD80+ ratio of F4/80+ cells was determined. *P < 0.05; #P < 0.05 (n = 3) for D and E. (F) Raw 264.7 cells were transfected with the RORE-Luc reporter with Myc-RORα and then treated with 20, 50, or 100 μM DHA for 24 hours. Luciferase activity was measured and normalized by β-galactosidase activity. *P < 0.05 (n = 3). (G) TR-FRET assay was performed using Lanthascreen RORα coactivator assay kit. The y axis represents ratio of fluorescence intensity at 520 nm (signal) and at 495 nm (background) (n = 4). The x axis represents log scale of DHA or SR1078 concentration. The data represent mean ± SD. Data were analyzed by Mann–Whitney U test for simple comparisons or Kruskal-Wallis test for multiple groups.